Acne is no longer just a teenage affliction. In fact, dermatologists often refer to it as a woman's disease, and drugstore shelves are filled with acne products specifically geared toward adult women. But how do you choose from the overwhelming selection of treatments? Which products are appropriate to use as you grow older, become pregnant, or enter menopause? How can you work with a dermatologist to get the most out of prescription acne medications? No one has to live with acne or its consequences. Breaking Out is an invaluable guide to understanding and combating acne that women of all ages can turn to with confidence. Acne is an elusive and resourceful foe. It is stubborn, with a remarkable ability to shrug off the most aggressive medical treatments. It is unpredictable, adept at appearing or disappearing without rhyme or reason. And it is malicious, capable of inflicting terrible damage in the form of physical scars that disfigure the face and emotional wounds that lacerate the psyche. Most of the women who come to my office with acne or acne scarring have spent years battling this tenacious adversary. They are fed up with embarrassing breakouts and with remedies that haven't worked for them. Many are devastated by the facial scarring that confronts them each time they look into a mirror or catch sight of their reflection in a store window. And they all are sick and tired of waiting for it to just go away. Even though adult acne is a common phenomenon, with as many as half of all women experiencing at least occasional flare-ups, most of my female acne patients can scarcely believe that they are still breaking out in their twenties and thirties, let alone their forties and fifties! A few years ago, writer Lydia Preston was one of these patients -- frustrated by years of fighting acne, and desperately unhappy about the scars on her face. These were experiences that she soon drew on when, after undergoing several surgical procedures to repair the scars, she collaborated with me on a book about my specialty, cosmetic laser surgery. I can safely say I have never met a journalist or researcher who became more thoroughly immersed in any subject. Lydia spent hours watching me and the other dermatologists in my office at work -- and then spent many more hours grilling each of us about what she had observed. She interviewed my nurses and aestheticians -- and even my office manager. She pored over medical journals and textbooks. She attended dermatology meetings to hear other specialists lecture. And she sat down for long, heart-to-heart conversations with dozens of my patients -- many of them other acne sufferers -- gaining the kind of insight into their emotional and practical concerns that busy physicians rarely have the time to explore. It is clear that she has brought the same dedication and passion for detail to this book about acne in women. As any dermatologist will instantly recognize from the names cited in the text, she has interviewed many of the world's leading acne experts -- true giants of dermatology, whose research constitutes the foundation for modern acne treatment. She has similarly sought out renowned authorities on acne scarring and scar treatment, on cosmetics and cosmetic chemistry, on alternative therapies, and on the psychological ramifications of skin disease. The result is a uniquely comprehensive examination of the myriad complexities of acne and the confusing welter of treatment options. The book's exceptionally clear explanations of how acne occurs and how different remedies work or don't work to eliminate acne should come as a revelation to anyone frustrated by years of persistent treatment failure. It will certainly be a source of reassurance and wisdom to which any woman can turn with confidence at any time when an acne outbreak occurs -- whether she is exasperated by periodic flares or heartsick over disfiguring cysts or scars. How do you sort through the hundreds of competing over-the-counter acne preparations that now crowd drugstore, supermarket, and department store shelves to zero in on the handful that are likely to be most effective for you? How do you avoid things that make acne worse? How can you work with a dermatologist to get the most out of prescription acne medicines? Treatments frequently fail simply because patients are not fully informed about how to use them correctly. What can you do to ensure that your medicines will work as they are supposed to? How will you cope with any side effects that may occur? And what steps do you take if your condition changes, as acne-prone skin inevitably does with age, or the hormonal shifts of pregnancy, menstruation, menopause, or any of a dozen other reasons? What about acne scarring? Even very mild or occasional breakouts have the potential to leave permanent scars, and despite numerous exciting innovations in dermatologic surgery, these mutilating rents in the fabric of the skin remain among the most daunting challenges that face any cosmetic surgeon. In many instances, the most effective techniques are also the riskiest ones. How do you weigh the relative risks and benefits? How do you find a qualified practitioner who will employ the best and safest methods for your skin type -- and for the types of scars you have? Finally, how do you heal the inner scars of acne? Countless studies testify to its damaging emotional impact. How does any woman get past those feelings to get over acne once and for all and move on with her life? 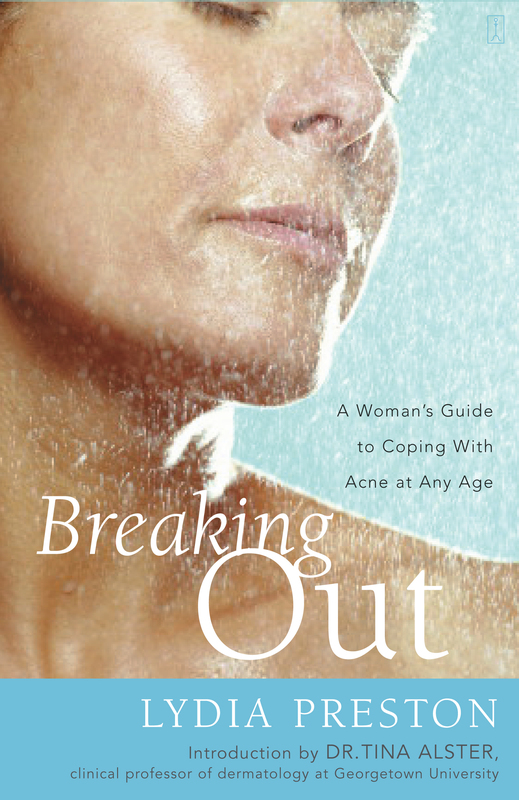 Breaking Out addresses those questions, and many more, with information drawn from Lydia's own experience with acne and the toll it takes, her years of reporting on dermatology, and her sympathetic exploration into other patients' concerns. I know it will be invaluable to all of my acne patients, and I look forward to recommending it to them. Dr. Tina Alster, clinical professor of dermatology at Georgetown University, is director of the Washington Institute of Dermatologic Laser Surgery and consulting dermatologist for Lancôme, luxury products division of L'Oréal USA, Inc.
Lydia Preston, a former staff-editor at Time-Life Books, has written about skin conditions for Self and Ladies Home Journal. Her consumer and health articles have appeared in Money magazine, The Washington Post Magazine, and National Geographic Traveler. She lives in Alexandria, Virginia.